Years of leaking water and melting snow mixed with road salts have caused significant corrosion to the Rayburn House Office Building garage's structural concrete. For the past 15 years, interim measures have been put in place to extend its life. Unfortunately, some areas have deteriorated to the point where interim measures are no longer an option, and parking cannot be supported. The Rayburn Garage Interior Rehabilitation will replace structural concrete and waterproofing joints to extend the life of the garage for 50 years. The rehabilitation will also bring the garage levels up to code compliance for mechanical, electrical and fire protection systems. Please see the FAQs for more. 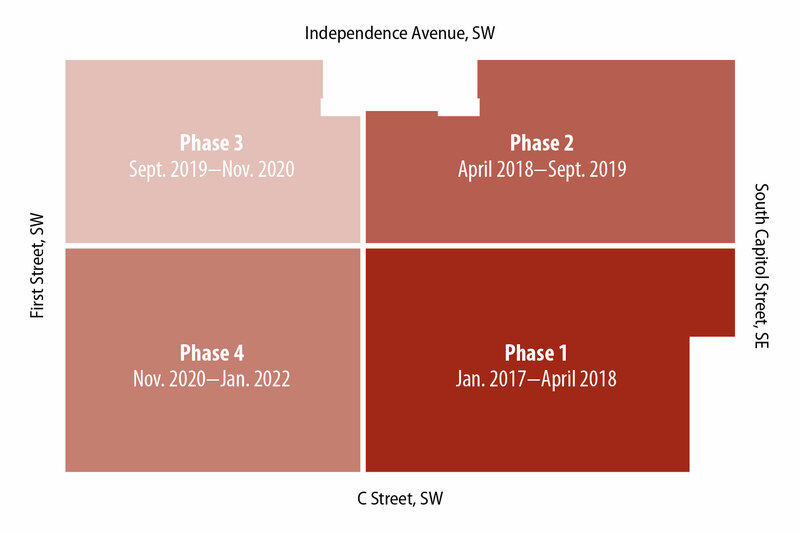 Phase 2 of construction will start with the repair and replacement of structurally deteriorating concrete slabs and bring the garage facility up to current building code requirements. Why is the work necessary now? Surveys taken every few months find more and more issues where concrete has deteriorated and it becomes a safety hazard. Chunks of concrete as large as a 3-ring binder and as heavy as 40 pounds have fallen. Dozens of parking spaces have already been closed to provide "catchment" systems to prevent the hazards associated with falling concrete. Major structural failures are becoming imminent and closures are necessary to maintain safety. The Rayburn Garage Interior Rehabilitation is a multi-phase project that will address one quarter of the garage during each phase. Phase 2 is underway. Future phases, dependent on the availability of funds, are projected below. How will my parking change? Parking has been reduced and re-allocated for all staff by House Parking Security. If you have questions regarding parking, please contact House Parking Security at 202.225.6750. The demolition process used to break up and remove concrete uses high temperature, high pressure water. The construction area will be loud, hot and humid. A large wall built across the garage will separate the area to ensure vehicles and pedestrians can safely be on the other side. What time of day will construction activities occur? The contractor is primarily working two shifts each day in order to meet the tight timeframes for each phase of the project: 1) The day shift is from 5:30 a.m. to 3:30 p.m., and 2) the night shift is from 8 p.m. to 7 a.m. While some noise will occur during the day, the heaviest noise producing activities will occur at night. How loud will noise producing activities be at night? Noise and vibration from even the lowest levels of the garage can carry to the upper levels of the building. Will work continue if Congress is in session at night? Noise-producing activities affecting staff will be reduced during time periods when Congress is in session, even if the session goes into the late night. Is the work occurring outside of the Rayburn Building on South Capitol Street part of this project? 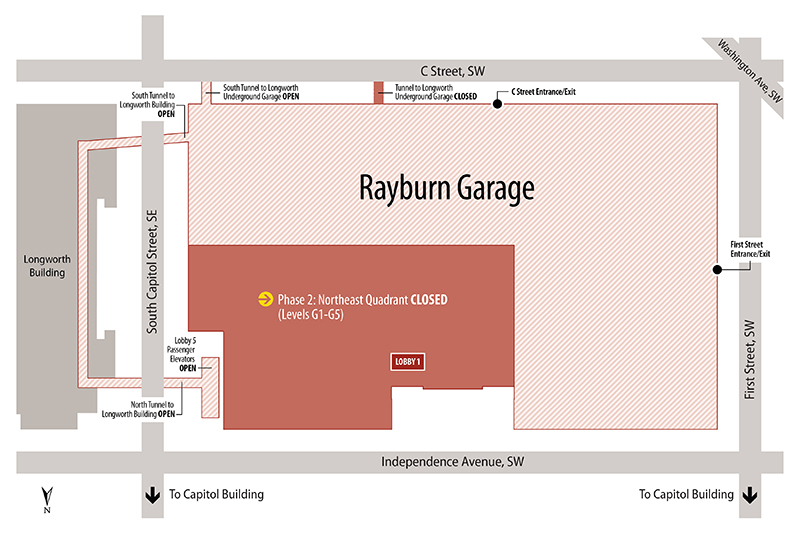 Yes, the Rayburn Horseshoe drive is directly above the garage on the east side of the Rayburn Building. Repairs were completed to the waterproofing joints to prevent water intrusion. The snow-melting system was also replaced below the asphalt for adverse weather conditions. The project will eliminate current safety hazards associated with failing concrete and provide for improved wayfinding and signage, code compliant mechanical, electrical and plumbing systems, more efficient parking utilization, additional elevators for the movement of freight, and increased security measures. American Disability Act accessibility upgrades are also being made. For additional questions related to this project, please contact Mark Galvan, General Engineer for the House Office Buildings, at 202.225.7754.